Since we started capturing the legacy of country music over a decade ago, we've lost 29 members from our Country's Family Reunions. 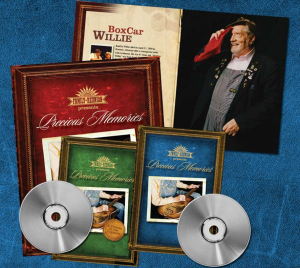 In honor of them, we've created Precious Memories, 2 DVD's and book collection remembering the achievements and lives of these dear country artists. Hosted by Bill Anderson, we take a look back at some wonderful moments from our many video series, plus give you tons of facts you might not know about the legends you loved. Grandpa Jones,Bashful Brother Oswald, Justin Tubb, Johnny Russell, Chet Atkins, Sheb Wolley, Goldie Hill, BoxCar Willie, Roy Drusky, Billy Walker, Del Reeves, Skeeter Davis, Bill Carlisle, T. Tommy Curtrer, Joe Allison, Buddy Killen, Johnny PayCheck, Martha Carson, Hank Locklin, Don Helms, Ernie Ashworth, Janette Carter, Jim McReynolds, Walter Bailes, John Hartford, Bobby Lord, Charlie Walker, and Merle Kilgore. And we top that off with a beautiful full color book full of photos and information so these Precious Memories are captured forever.